NBCPeyton Manning says he almost didn’t do the United Way digital short when he hosted ‘Saturday Night ‘Live in 2007. At a Indianapolis Colts luncheon on Wednesday, Peyton Manning gave a behind the scenes account of his United Way sketch on “Saturday Night Live” in 2007. 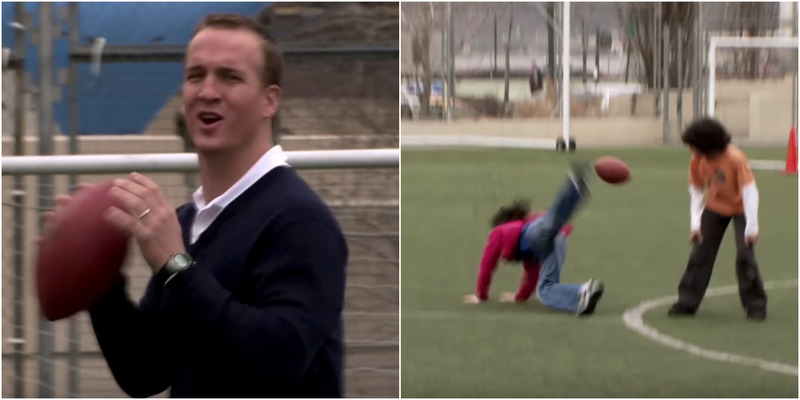 One of Peyton Manning’s most famous “Saturday Night Live” sketches almost didn’t happen. Speaking at the 2018 Indianapolis Colts kickoff lunch on Wednesday, TMZ reported, the former Colts quarterback gave a behind-the-scenes account of his 2007 “SNL” hosting gig. One of the most enduring sketches to come out of the episode was a digital short spoofing Manning’s ads for the United Way organisation. The script called for Manning to play touch football with a group of kids, and get too competitive – striking multiple kids with his laser-like throws. “I remember the director said, ‘Peyton, you’re a charitable guy, this is why it’s going to be funny. And it’s only going to work if you’re all in, and you whack these kids right in the head.’ And I kept saying my mother is going to be so disappointed,” Manning recalled. NBCThe sketch also shows Manning teaching the group of youngsters how to break into a car. He gave it a go, but found it “very awkward and uncomfortable” hitting the child actors in front of their parents. So he finally told the director he couldn’t do it. Manning said the director was accommodating, saying they didn’t have to do something that put Manning out of his comfort zone. But Manning quickly changed his mind when one of the child actors’ parents came up to him and begged him to hit their child.